Ethio Cali is a Los Angeles-based Ethio-Jazz ensemble who’s sublime sound is inspired by the golden age of Ethiopian music of the 1960s and 70s, filtered through a lens that is uniquely Los Angeles. Acknowledging the diverse musical foundations of Ethio-Jazz, the ensemble also draws inspiration from the rhythmic and melodic textures of Sudan, Somalia, Ghana, and Colombia. Join us for Arts Brookfield Live! 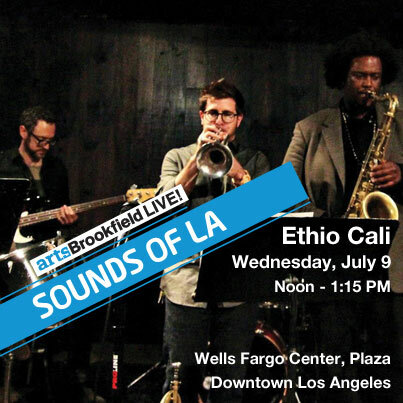 Sounds of LA featuring Ethio Cali at the Wells Fargo Center Plaza in downtown LA’s Bunker Hill Wednesday, July 9th at 12pm. The bi-weekly lunchtime concerts offer an eclectic snapshot of the current music scene in Los Angeles with an array of talented singer songwriters and small ensembles performing the best in traditional and contemporary music. This event is free to attend. See you there!